Content by Tony Macklin. Originally published on December 6, 2014 @ tonymacklin.net. The word surveillance has the letters "evil" in it. At least metaphorically, Edward Snowden realized that illegal intrusion by the National Security Agency into private lives and confidential communications opened a Pandora's box. 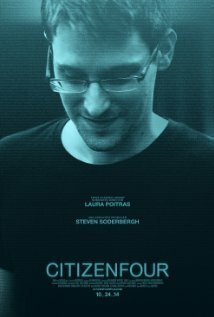 Under the name Citizenfour, Snowden contacted filmmaker Laura Poitras and investigative journalist Glenn Greenwald, whom he trusted. He was prepared to reveal reams of secret documents exposing the NSA's tapping into the personal lives of U.S. citizens and others around the world. Citizenfour is an engrossing documentary movie about the journey of a whistleblower and the professionals who supported his vision. Whether or not the public does is another issue. What is especially effective is that much of what happens is in real time - director Poitras was present with her camera as it was taking place. That gives the film an extra feeling of immediacy. We are first introduced to the physical Snowden in a hotel room in Hong Kong, China, where Greenwald interviews him, and is later joined by Ewen MacAskill, a colleague from the British newspaper The Guardian. The 29-year old Snowden does not appear arrogant. He's clear-eyed, bespectacled, and has some facial hair. He seems to have a genuine, idealistic purpose. Snowden was a contractor for the NSA in Hawaii, and was disturbed by the scope and stealth of the NSA's intrusion worldwide. He believed he had to do something. And so he did. He didn't tell anyone he knew, because he was aware that would put them in a difficult and perhaps dangerous situation. In the film, Snowden spends eight days in the hotel room. At first, he laughs easily and seems calm and perceptive. But as the days pass, he has to face stress at which he could only guess. When the story breaks, he seems rattled watching tv. Later when a fire alarm test keeps breaking in, it adds a dissonance. Snowden looks tired when he is preparing to leave the hotel. He replaces his glasses with contact lenses, and tries to shave. But the electric shaver he is using is inadequate. But even under great duress, Snowden remains committed. Glenn Greenwald is introduced in his home in Rio de Janeiro, Brazil. Several dogs are near him, but he doesn't let sleeping dogs lie. He becomes the artful spokesman for Snowden. Poitras provides several sly images such as the dogs. One shot includes a book in Snowden's hotel room - Cory Doctorow's novel, Homeland. The final shots are hands scooping up heaps of torn-up scraps of paper. There's something heroic about Citizenfour. But does the public really care? We live in a society in which we accept what Little Brother says. Countries go to other countries and take their natural resources for freedom, leaving the other country's freedom in tatters. Would we welcome foreigners tearing up Main Street to take it back to their homeland? Probably not. Freedom is license, not to be shared. Nathaniel Hawthorne had a character in one of his short stories say, "Evil is the nature of mankind." No, it's not. Hypocrisy is the nature of mankind. We live in a propagandized society. We vote against our own interests. Commercials rule. One car is "love"; another is "truth in engineering." If we get love and truth in wheels, why look elsewhere? If a cure for cancer were discovered - if ads and money opposed it - 50% of the public probably would reject the cure. Don't take away freedom to have cancer. Except if I get it. In Citizenfour, a former presidential press secretary says that the public is willing to give up personal freedoms. Snowden resists. Many think a whistleblower is a "rat." It is common parlance. Maybe Snowden is a patri-rat. Citizenfour is a movie about something that is both complicated and simple.